The ISSA (Established in 1999) aims to protect, advise, educate and promote the basic rights of all staff that work within the racing sector of the Irish Equine Industry, through negotiation and open dialogue with the IRTA (the responsible body of the Irish Racehorse Trainers) since 1972. The basic rights of the worker under the Agricultural Agreement and the National Minimum Wage Act are protected by Irish Employment Law. In August 2004, a landmark agreement (the first of it's kind in the world) was reached between the ISSA and the IRTA, with input from H.R.I. (the controlling semi-state body). It recognises the unique talents of staff that work with and ride Thoroughbred racehorses in this country. Even though minimum terms and conditions of employment have been established under the existing “Agricultural Workers Joint Labour Committee”, it was the view of both parties that a separate agreement should be reached which recognised the uniqueness of employment in the horse racing industry. Arising from extensive negotiations between the Irish Stablestaff Association and the Irish Racehorse Trainers Association, the following agreement has been reached setting out minimum terms and conditions of employment for Stablestaff. In establishing these terms and conditions it is recognised that these are minimum levels. This agreement does not prohibit a trainer from paying more favourable terms. It does, however, prohibit the employer from paying less favourable terms. Rates of Pay for stablestaff effective from the 1st February 2017 agreed by the ISSA (Irish Stable Staff Association) plus the IRTA (Irish Racehorse Trainers Association) and overseen by HRI(Horse Racing Ireland). Therefore recognizing the uniqueness of the work carried out. The parties to this agreement acknowledge the need to improve training and career development opportunities within racing as a means of aiding recruitment and retention in the industry and ensuring the continued availability of a highly skilled, flexible and well motivated workforce. Following consultations with the various stakeholders, the parties are committed to the introduction and promotion of relevant training courses to meet the identified needs of the Irish horseracing industry, with an emphasis on flexible, cost-effective delivery and accessibility for people throughout the country. 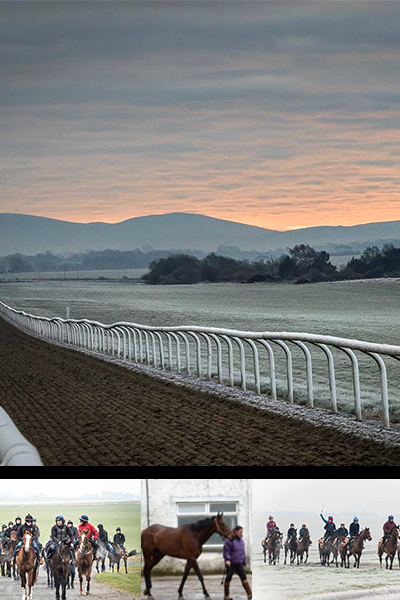 It is envisaged that the Racing Academy & Centre of Education (RACE) will play a major role in the provision of a broader range of training services to the industry in the future, to include industry-certified training for racing grooms, skills development for existing stable staff and enhanced support services for jockeys. In addition to the above expenses, a worker will be reimbursed for any accommodation expenses incurred. Expenses will also be paid in advance. Revenue permitted tax free allowances will be applied. If attending a Saturday evening race meeting, working the next day is voluntary. Attendance at a Saturday evening race meeting is voluntary. In the event that an employee opts not to work at the Saturday evening race meeting then he/she accepts the right of the Trainer to make alternative arrangements. In the event of not returning to the yard until after midnight, an employee will not be required to attend for duties before 9.00am that morning. In relation to workers under the age of 18, the provisions of the Protection of Young Persons (Employment) Act, 1996 shall apply. Trainers are expected to fully familiarise themselves with this legislation and to comply with its provision. A 39 hour week year round. 38 hours for 6 consecutive months. 36 hours for 3 consecutive months. Overtime rates shall be payable in respect of all time worked in any week in excess of the declared normal hours of work for that week. Where hours of work (including overtime) exceed 48 hours per week, the total number of hours in any 7 day period must not exceed 48, averaged over a period of six months. The months of the averaging period must be consecutive, but the employer may choose which six months they will be. Only a half day shall be worked on Saturdays unless the contract of employment provides otherwise, or 24 hours notice of a requirement to work after 1.00pm on Saturday is given to the employee by the employer. The rest periods specified for workers in Sections 11, 12, and 13 of the Organisation of Working Time Act shall not apply. Employers shall ensure that their employees have equivalent compensatory rest periods and breaks available to them in accordance with the guidelines set out in the Code of Practice on Compensatory Rest Periods (S.I. 44 of 1998). Given the nature of the industry, employees shall work during weekends subject to their right to one weekend in two free from duties on a rota basis. For all time worked in excess of normal hours of work on any day other than Sunday, and including after 1.00pm on the short day, the minimum time rate is time and one-third ( 1.33). For all time worked on Sundays, the minimum time-rate is time and two-thirds (1.66). In accordance with the provisions of the Organisation of Working Time Act, 1997, for normal hours worked on Public Holidays, time by two applies (2). For hours over normal hours, the rate shall be time and one third by two (1.33 x 2). It is accepted that no employee should be expected to work extended periods without time off. In addition he/she will receive a €25 call out fee in addition to the Sunday expense rate if required to work. In accordance with the provisions Terms of Employment (Information) Acts 1994 – 2001, all employees should be provided with a contract of employment by their employers, within two months of the commencement of employment. The contract will include details of the terms and conditions applicable to that employee employment. "Leave year" means a year beginning on 1st April in any year. 8% of the hours worked in a leave year, but subject to a maximum of 4 working weeks. In order that no difficulty arises when planning holidays, holiday requests must be submitted to the employer for approval in advance. Part-time and short-time employees must have worked for at least 40 hours in the 5 weeks before the public holiday to qualify for public holiday benefit. For the purposes of computing holiday remuneration, no deductions shall be made for benefits provided by the employer but not enjoyed by the employee whilst on annual leave. A day which would be regarded as a day of annual leave shall, if the employee concerned is ill on that day and furnishes to the employer a medical certificate in respect of the illness, not be regarded as a day of annual leave. The annual leave of an employee who has 8 or more months of service shall include an unbroken period of 2 weeks. An employee shall be regarded as having worked on a day of annual leave the hours he would have worked on that day had it not been a day of annual leave. Entitlement to leave and public holidays for short-term and part-time employees shall be calculated in the same manner as in paragraphs 2 and 3 herein above. Where an employee ceases to be employed and the whole or any portion of annual leave remains to be granted to him, the worker shall be paid an amount equal to the pay that he would have received if he had been granted that leave. In accordance with Rule 298, of the Rules of Racing and INHS Committee Rules, monies are paid to the Employers for distribution to registered employees on four occasions each year. Payments will be made in the months of April, July, October and January covering the quarters ending in the preceding months. The amount of the payment to be made to each employee should be based on rules and guidelines to be agreed at a local level by employees only. A signed copy of the agreement (by two or more employees) must be lodged with the Turf Club & INHS Committee, and displayed in the tack room. All employees to whom this agreement applies, having a minimum of one year’s service with their current employer shall be covered by a Sick Pay Scheme which entitles them to payment during absences due to illness. Such a scheme shall be provided by the employer, and shall be non-contributory. No payment shall be made in respect of the first 3 days of any absence on sick leave. For entitlement to payment, a certificate signed by a medical practitioner must be produced by the third day of any absence on sick leave, specifying the nature of the illness. Certificates must be produced weekly thereafter for continuance of entitlement to sick pay. It will be the employee’s duty to ensure that the employer is informed of his/her absence from work due to illness before normal starting time on the first day of absence. Entitlement to benefit under the Scheme will apply only during a 12 month period in any Scheme year, and will not carry over from one year to another. After one year’s service: 3 weeks’ pay at appropriate minimum pay rates as set out in this agreement and as amended thereafter, less Social Welfare entitlement. The employer will be entitled to refer an employee for assessment by a doctor nominated by the employer.The cost of any such referral will be paid by the employer. The employee will be responsible for claiming his/her Social Welfare entitlements while on sick leave, and for paying over such payments to the employer. Monies not paid over within 6 weeks of receipt by the employee may be treated by the employer as payment of wages in advance. In the event of absences arising from the death of a spouse, son, daughter, brother, sister or parent, up to three workings days will be paid. In accordance with Health and Safety legislation, helmets, back protectors, boots and gloves will be provided by the employer. Employees, in turn, have a responsibility to properly use equipment provided and to take adequate care of this equipment at all times. A “Code of Practice” on dispute resolution tailored for this industry has been drawn up. The purpose of this “Code of Practice” is to provide a fair approach to issues that might arise in individual yards. Where an employee’s conduct, attendance or performance warrants disciplinary action, the following procedure will apply except in cases of gross misconduct. The employee will initially be given a counselling by his/her employer, which will be recorded on the employee’s file. In the event of a further breach, the employee will be issued with a formal written warning, a copy of which will be retained on the employee’s file. In the event of yet a further breach, the employee will be given a final formal written warning, and may be given a period of unpaid suspension. The letter will clearly state that a further breach will lead to dismissal. If, following stage 4, there are further breaches, the employee will be dismissed. Note: With the exception of counselling, an employee is entitled to have a witness present at any meeting with the employer in the form of a colleague or a representative of the Irish Stablestaff Association. Having received a warning at any stage up to stage three of the procedure, where an employee’s record subsequently remains clear for at least six months, that employee will revert to the previous stage of the procedure. In the event of having reached stage four, an employee’s record will revert to a previous stage after maintaining a clear record for at least one year. Before any decision is taken to impose disciplinary action, an employer must investigate the matter first and consider any responses given by the employee. In cases of Gross Misconduct such as fighting, theft, wilful damage to property, reporting for work under the influence of alcohol/unprescribed drugs, breaches of trust, abuse and neglect of horses, etc., an employee may be summarily dismissed without recourse to the normal disciplinary procedures. Where an incident constituting gross misconduct arises, an employee may be suspended with pay in order to facilitate an investigation. Following investigation, and having established that misconduct has occurred, the employer may decide to impose an alternative form of discipline such as unpaid suspension. It is in everyone’s interest to establish a clear procedure for the resolution of all issues arising between them. Grievances will occur in the normal course of interaction in the workplace. A failure to follow a procedure to deal adequately with grievances as they arise will inevitably lead to disputes affecting the workplace. It is vital that all grievances are dealt with, without undue delay. The grievance will be discussed between the employee and his/her employer. Failing a resolution of the issue, the matter will be referred by the employee to a representative of the Irish Stablestaff Association. The representative will contact the employer with a view to endeavouring to achieve a resolution. The matter will be referred to the “Internal Referral Committee” established under this agreement, which will investigate the issue and issue a decision within seven working days. Should the matter remain unresolved, it will be referred to the Labour Relations Commission for conciliation or for a hearing by a Rights Commissioner, whichever is appropriate. If still unresolved, it will be referred to the Labour Court for a formal investigation. During the period in which the above procedure is being followed no form of action will be taken by either party in the form of strike, lockout, walkout, sit-in, go-slow, or any form of industrial action designed to bring pressure to bear on either the employee or the employer. rk free from any form of bullying/harassment. Sexual harassment should not be confused with simple friendly behaviour or with more intimate exchanges, if these are mutually desired and accepted. The difference between friendly behaviour and sexual harassment is that sexual harassment is neither solicited nor accepted by the recipient. It is simply unwelcome and/or imposed. The reporting procedures, investigation and disciplinary measures are treated in the same fashion for both scenarios. Be aware that bullying / harassment can take many forms and is not always obvious, but can be subtle or insidious in nature which is no less upsetting to the victim. It is also important to note that bullying / harassment is generally defined not necessarily by its intention but by the impact of the behaviour on the recipient. So be aware that what you consider inoffensive may be unacceptable to another individual. Many incidents of bullying / harassment can be dealt with effectively in an informal way. Often the harasser may be unaware of the effect their behaviour is having on others. Therefore speaking with the person in question, making it clear that their behaviour is unwelcome, may be enough to rectify the matter. If this action does not result in the bullying or harassment stopping or a more serious incident arises, then you should use the Formal Procedure. In the first instance, you should contact your employer at the earliest opportunity and outline, in writing, the nature of your complaint advising that you wish to make a formal complaint. If your complaint relates to your employer, you may approach the “Internal Referral Committee” established under this agreement. No action will be taken without prior consultation or discussion. Any complaint of bullying / harassment will be treated with sensitivity. During investigation discretion will be a priority, but confidentiality cannot be guaranteed. In the interests of natural justice, the alleged perpetrator also has rights and will be given every opportunity to a fair and impartial hearing and a right to challenge any allegation.Witnesses, where appropriate may also have to be interviewed. All allegations / complaints received will be thoroughly examined and where a complaint is upheld, the matter will be dealt with in a manner so as to ensure no further difficulties arise. Where appropriate, external assistance will be provided to both the accused and the victim. It is important to note that malicious/false allegations will be treated as a disciplinary offence. A Referral Committee has been established to examine any complaints referred on breaches of this agreement. The Referral Committee will also meet on at least an annual basis to review the working of this agreement in its entirety and issue a short written report to the Board of Horse Racing Ireland. Additional representatives from other bodies, if deemed appropriate, may also be included in the committee. Working under standing orders, the Referral Committee will examine any written complaint referred on breaches of the Agreement on Minimum Terms & Conditions of Employment for Stablestaff. The Referral Committees findings will be published and considered binding.